A guy who has done it all in his Hollywood career, funnyman Owen Wilson is one of the leading comedic actors on the planet. Forever linked to his memorable roles in such comic gems as Wedding Crashers and Zoolander, the Texas native has ridden his dry wit and unmistakable southern charm to box-office pay dirt time and again as one of the industry’s most bankable stars. When Wilson stopped by the Bell Centre earlier this year to catch a game, we couldn’t let him pass through Montreal without getting the inside scoop on his ties to hockey and his upcoming projects for the silver screen. So where did your interest in hockey originate? I got more into hockey when the Stars came to Dallas, but it really started for me in 1980 when the U.S. won the gold medal at the Olympics. That’s when everyone got into hockey. Over the years, I’ve gotten to meet some of the guys and go to some games. Did you play any hockey as a kid? You guys all played football growing up, but how would the Wilson brothers have done together out on the ice? We’re from Texas, so there wasn’t a lot of hockey happening in the Wilson household. My dad is from Massachusetts so he played as a kid, but we were more into football than hockey growing up. What sport do you follow the most? What’s your favorite team? I’ve always been a big Cowboys fan – I don’t know what’s going on with them this year. They seem to be in a bit of a tailspin. Hopefully they get it turned around soon. I’m also a Brett Favre fan so I liked Green Bay for the longest time and I root for the Vikings now. Owen makes a new friend. You’ve been spotted at a few rinks around the NHL. How often do you make it out to games? It’s one of those sports where it’s exciting to watch on TV but it’s not until you go in person that you really see how great it is and how fast it is. I went to a few Canucks games when I was shooting in Vancouver a few months ago and I’ve been to a few Kings games, too. Who’s your favorite player in the league today? I know he just retired, but I’ve always liked Chris Chelios. He lived in Malibu near me so I got to know him a bit and I went to see him play in Atlanta a few times. Vince Vaughn isn’t shy about his love for the Blackhawks. Has he been trying to get you on the Chicago bandwagon? Has he been unbearable since they won the Cup? Vince is a huge Blackhawks fan and it was pretty cool to see that playoff run last spring. He was definitely pretty proud of that, but I think it meant a lot to everyone in Chicago to see that finally happen. It’s been a few years since you and Vince did Wedding Crashers – how many people have come up to you since then telling you about weddings they’ve crashed? I’ve heard a few of those stories and I’ve also heard from a couple of brides who have had their weddings crashed. I’ve also definitely had more than a few offers from people who want me to come crash their weddings. 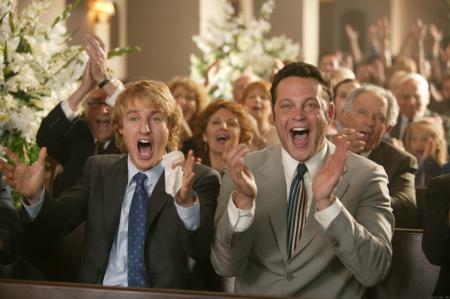 Owen and Vince Vaughn crashing weddings in 2005. What actors today really make you laugh? Vince is by far one of the funniest people I know. He can definitely make me laugh. 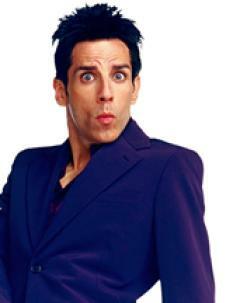 Ben Stiller is another guy who I think is absolutely hilarious. We’ve lost count, but you’ve made at least 10 movies with Ben Stiller. Is he in fact your brother from another mother? (laughs) It’s funny how many movies we’ve ended up doing together. We really feed off each other on set and get a kick out of coming up with lines to make each other laugh. If I have an idea and it makes Ben laugh, I know it will work. Blue Steel just came naturally to Stiller. Speaking of Ben, you’ve got Zoolander 2 in the works and slated for a summer 2012 release. How much are you looking forward to reprising your memorable role as Hansel McDonald? How many faces did Ben have to try before he finally settled on “Blue Steel”? Ben just had that one right away. He turned and did it for me and I just knew it was the “look”. People come up to me and ask me to do Blue Steel and I can’t even do it. That’s all Ben. Other than the ability to turn left, what’s the real secret to winning a “walk off”? (laughs) It just always comes down to the old “pulling your underwear off with your clothes on” Zen master approach to runway modeling. That’ll trip up the competition every time. 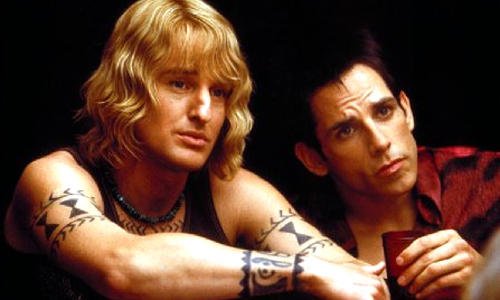 Owen and Ben Stiller being really, really, ridiculously good looking in Zoolander. You’ve been working a lot recently and now you have two movies coming out the same week this December. The star of the movie isn’t supposed to play favorites but which film are you really hoping comes out on top: Little Fockers or How do you Know? I feel like Little Fockers doesn’t really need my help; it has such a built-in following that hopefully people will go see that. But I think I’m rooting for How do you Know? mainly because it’s directed by Jim Brooks and he’s the guy who gave my brothers and I our big break and produced our first movie. Of all the characters you’ve played, which one was the closest to the real Owen Wilson? Which of your scenes still cracks you up every time you watch it? Some of the scenes from Zoolander still make me laugh every time I see them. The first movie I did was called Bottle Rocket and I got to work with my brothers Luke and Andrew and my friend Wes Anderson directed it so that movie always has a special place for me whenever I watch it because it was the first. You know you’ve made it in Hollywood when you have your own action figure. 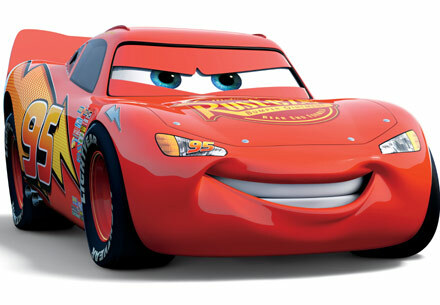 Be honest – how much do the ladies love your Lightning McQueen Cars action figure? (laughs) Yeah, that thing is great! We’re actually doing a sequel to that which will be out next summer. The cool thing about that is they’re doing a big 60 acre thing at Disneyland that’s going to be devoted to Cars with rides and games and the whole deal in 2012. As a kid all I ever wanted to do was go to Disneyland so it’s exciting to be a part of this. I’m going to have a whole new fan base that just recognizes my voice. You just wrapped another movie. What was it like working with a legend like Woody Allen for Midnight in Paris? We shot that in Paris so I got to practice my French before coming up here. Woody is a great guy and he’s actually a big sports fan and a lot of fun to work with. Working with him was an awesome experience. You do a lot of improvising in your movies – how much improv did Woody let you get away with on set? A lot actually. He’s was surprisingly really open to coming up with stuff and making suggestions and having an open dialogue. That’s such a great environment for an actor to feel comfortable to try things out. Follow Owen’s projects through his profile on imdb.com, or to learn more about How Do You Know? and Little Fockers, in theaters now, head to littlefockers.net and howdoyouknow-movie.com. This article, written by Shauna Denis, was published in CANADIENS magazine Vol. 25 No. 2.